Opening with massive expectations after its predecessor raked in huge dollars at the South Korean box-office (along with most Asian territories), and garnering a largely positive response from the hordes of movie goers who flocked to cinemas to see it, Along With the Gods: The Last 49 Days has a lot to live up to, and while certainly entertaining, it doesn’t quite reach the lofty heights audiences so obviously want it to aspire to. Before I go any further, I must warn anyone who still hasn’t seen the first film that the following review will contain spoilers, so please avoid reading this until you have done so. 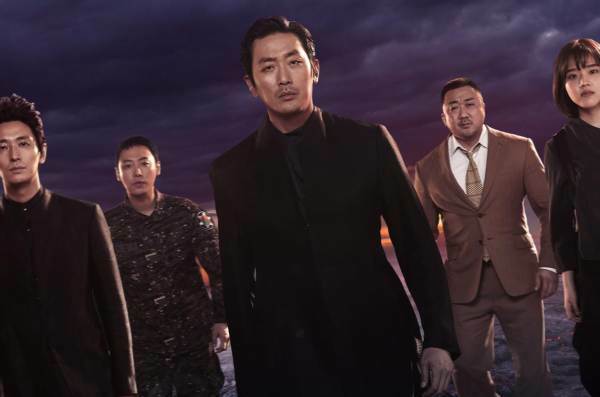 Chapter Two begins right where the original ended, with guardians Gang-rim (Ha Jung-woo) and Hae Won Maek (Ju Ji-hoon) facing off against an army of sand warriors, while fellow guardian Duk Choon (Kim Hyang-gi) keeps an eye on new arrival Soo-hong (Kim Dong-wook), the brother of firefighter Ja-hong (Cha Tae-hyun), who successfully achieved reincarnation in the previous tale. Soo-hong, who endangered his sibling’s journey due to becoming a vengeful spirit in the living world, now has the opportunity to walk the same path as his brother, but many in the afterworld see this as a violation of laws that have been in place for centuries. King Yeomra (Lee Jung-jae), ruler of the spiritual realm, says he will allow this trial to take place only if the three guardians will also bring to him a soul that has long passed its expiry date, all within the allotted 49 day time frame. If they fail, the trio will lose their guardianship, and will never have the chance to achieve reincarnation. Travelling down to the living world, Hae Won Maek and Duk Choon locate this stubborn soul, which should have ascended long ago, and discover that the elderly man in question is under the protection of a troublesome Household God by the name of Sung-ju (Ma Dong-seok), who is prolonging this person’s life until his young grandson can be suitably looked after. Unable to defeat him, the two guardians agree to Sung-ju’s demands, and as they wait out these few weeks, the Household God recounts their pasts, as both had their memories wiped when they crossed over to the afterworld. In the spiritual realm, Gang-rim leads Soo-hong through a truncated trial process, but the two do not get along, and in an attempt to calm the waters between them, tells Soo-hong about his own history, and what lead to his demise on earth. With the 49 days quickly disappearing, each mission starts to look like a lost cause. While Along With the Gods: The Two Worlds managed to bring all its elements together reasonably well, the sequel doesn’t fare as well, with numerous plot threads and time frames that don’t fully hang together, mainly because their outcomes are a foregone conclusion. Ja-hong’s journey in Part One remained intriguing and absorbing, containing detours that provided a moderate amount of surprises. However, Soo-hong’s path to reincarnation lacks the freshness and emotional centre of his brother’s, as information we obtained in the first film undercuts any air of uncertainty and tension the film-makers are trying to build up. On top of that, the major subplot developed during the guardians’ flashbacks is way too obvious, leading to an utterly predictable conclusion. These particular flaws drain the movie of its overall dramatic impact. There is even a scene that feels unnecessary, when Soo-hung’s fears materialise from the vast desert sands he and Gang-rim are travelling across, culminating in an amusing but oddly distracting homage to Jurassic Park. The cast acquit themselves well, doing their best to overcome the more cumbersome plotting. With Kim Hyang-gi again delivering a nicely expressive performance, one wishes there were more female characters dotted throughout these worlds, and it does stand out that the Gods which are missing from Soo-hong’s shortened trial are the female ones (whether this had to do with the reshoots after supporting actor Oh Dal-su was suddenly ejected from the production due to pending criminal charges, is hard to say). The biggest asset here is Ma Dong-seok (Train to Busan, The Outlaws, Derailed), who brings considerable charm and humanity to proceedings as the kind-hearted Sung-ju, and lifts the film whenever he is onscreen. One just wishes there was more of him. Returning director Kim Yong-Hwa (Mr. Go, Take Off) continues to show confidence in executing large-scale FX set-pieces, but falters on this occasion in efficiently weaving the various plot threads into a fluid, cohesive whole. Production values are just as impressive second time around, and the technical crew definitely deliver some stand-out moments. While it is undoubtably a step down from the first film, Along With the Gods: The Last 49 Days is still a lot of fun, particularly when Ma is around, and for those who want this expansive, expensive adventure to continue, make sure you stay during the end credits.